If you were to trace the roots of Bay Area hip-hop, you would definitely find David Paul's legendary Bomb magazine. Over the last 17 years the Bomb Hip-Hop label's influence and contribution to the promotion of the four elements of hip-hop is undeniable. Bomb has expanded since its humble beginnings in 1991 as a hip-hop publication to one of the fifteen independent labels that matter according to Rolling Stone magazine. In 1994 Bomb released their first album, Bomb Hip Hop Compilation. The album featured some of the best up and coming west coast artists at the time - Charizma, Peanut Butter Wolf, Madchild, Qbert and more. 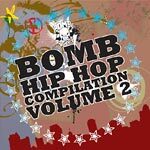 Now 14 years and 70 releases later, ranging from DJ and B-Boy comps to international features like Bomb Worldwide, the label presents the long awaited follow up, Bomb Hip Hop Compilation Volume 2 with tracks by Dirt Nasty, Bash Bros. feat. DJ Icewater, Kalri$$ian, Million Bucks, Rec-League All-Stars and more.